Empty asphalt roads that shimmer under the heat of the afternoon sun. Goats grazing on dusty fields, munching the small tufts of grass that grow along the rocky slopes and rolling brown hills of Sumbawa. A small fire by the roadside sent a black column of smoke up into the clear blue sky. It was fair to say that my first impression of Sumbawa was a mixed one and a world away from the lush green fields and packed roads of Lombok. My first impressions of Sumbawa were not very positive. My impressions of Sumbawa had to be put on hold though, because almost as soon as we arrived on Sumbawa we were whisked away for the night to the small island of Kenawa. The next morning we were back on the road and ready to start exploring the island. The islands close to the port are really beautiful. After two hours on an almost empty and completely flat road, I decided that my first impression of Sumbawa was not too far wrong. The small strait between Lombok and Sumbawa appears is as much a physical barrier as it is an economic one. With little industry, poor agriculture and few job opportunities, there is very little happening across much of Sumbawa. 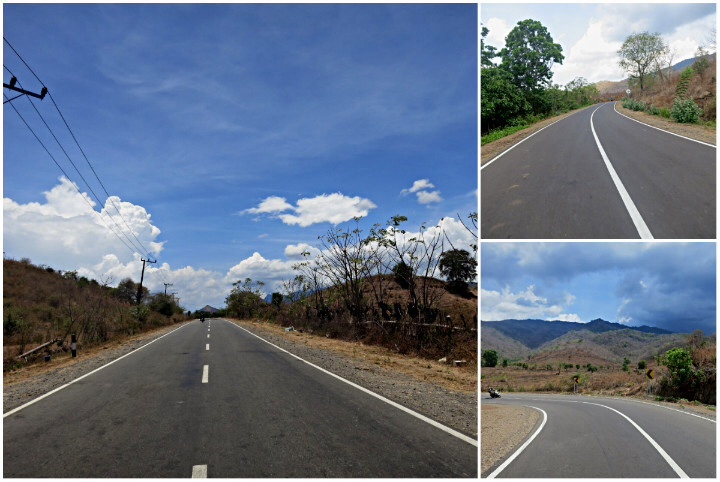 Much of Sumbawa remains under developed , though the infrastructure is already here. Here and there the empty shells of large buildings were a sign of the hollow dreams of development. There were few tourists on the road or in the hotels. The roads were populated by a mixture of crazed bus drivers who sped along the roads taking the hairpin bends at an eye watering speed and large trucks that trundled at a snails pace moving quarried stone around like overloaded worker ants. 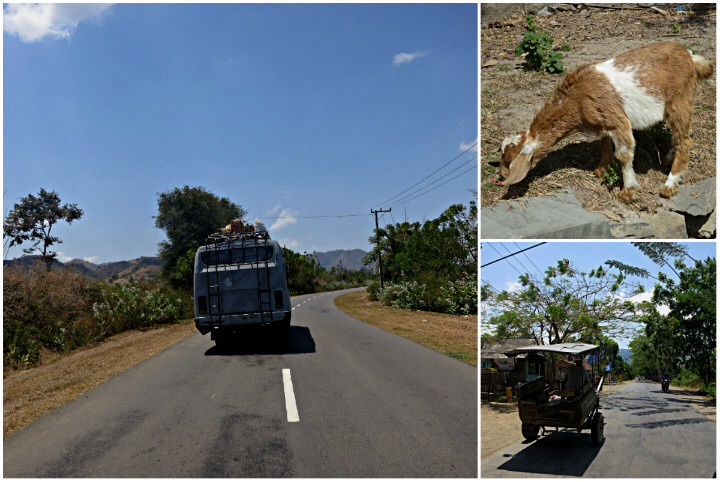 Sumbawa has lots of goats and crazy drivers. There are pockets of hope though. Moyo Island, off the North coast of Sumbawa, is going through a miniature construction boom. Resorts are rising out of the dirt alongside the sandy beaches in the hope that this pocket of land could become the next Gili Trawangan. The Island is already famous within Indonesia, because one of the luxury resorts played host to Princess Diana when she visited the country. Unfortunately poor transportation and the high cost of renting a boat meant that I never had the opportunity to visit Moyo Island. The combination of these two factors are undoubtedly going to be a big problem if the mainland hopes to benefit from the growth of tourism in Moyo. The beaches here have a pink color, which is the result of the coral. Another pocket of localised development on the South coast of the island holds out more hope for the near future. The main tourist spot is currently around Lunyuk. The area is already famous with surfers for the great waves, nice breaks and golden sandy beaches. There is a small airport that serves the area and several backpacking hostels where you can stay. It is all very tranquil, but it is the large mining operation, run by the American firm Newmont Mining and hidden behind fences and surrounded by steep hills, which has been the real catalyst for development. Parts of Sumbawa are developing, but things happen very slowly here. The companies employees, many of whom also love to surf, have been pushing money into the local economy. They spend their weekends down by the beach eating at the local restaurants and drinking at the local bars. Their families come to visit and stay in the local hostels and employees with money to burn and an eye for investment have been picking out prime pieces of real estate to develop into resorts, both large and small, and holiday homes. In many ways, it reflects the kind of balance that will hopefully be reached in Kuta at some point in the future. Great food and beautiful beaches make Sumbawa a nice choice for a relaxed holiday. Sumbawa is a beautiful holiday destination and has its charms, but there is an awful long way to go until it becomes a popular tourist destination. 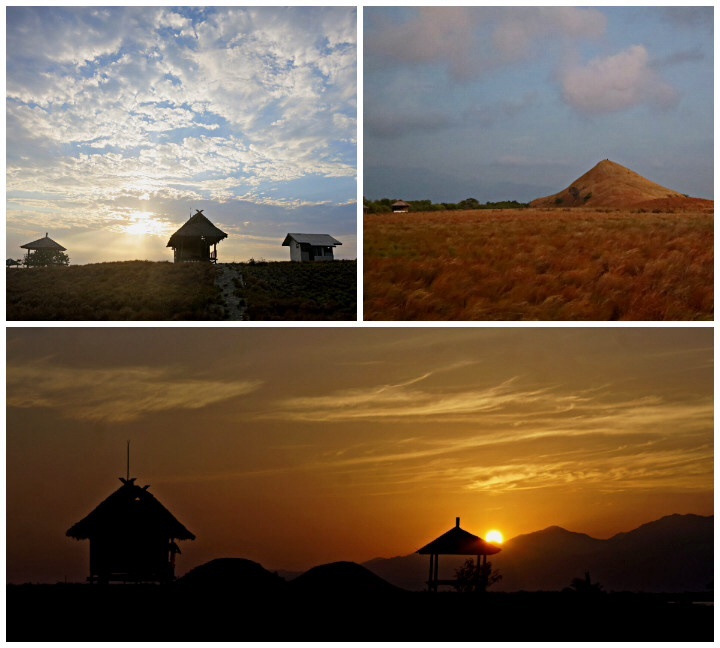 For those who think that Lombok is already too developed, Sumbawa offers a nice alternative. The at times uneasy balance between industry, development and tourism for the moment seems to be working in Lunyuk, making it one of the obvious highlights for anyone looking to explore Sumbawa.